UPDATE: Click here for Photo Journal and see end of this article for more. Was it heaven or was I back in the Gore Range over the weekend? If your doubting me, I've got a feeling you haven't been in the Gore Range lately, or probably ever. My wife and I are busy people with busy jobs and busy kids and we could come up with more than a hundred excuses for not doing this or that, but we overcame the excuses and were treated to another spectacular hike through one little corner of the Gore Range. This hike might be seen by some as a bit of a push on the first day. It's a little less than six miles, but up 2100 feet. We started at 11:30 a.m. and were at Lost Lake right about 4 p.m. Now, we are in excellent shape, but if you are concerned about the trip in just get going a little earlier and take your time. Besides, the first hour is through open sage brush and will be down right hot if you let it get too late in the day. Another alternative to how we did this trip would be to leave late in the day and hike just as far as the Brush Creek Trail Head. This is a nice area to camp and it would make the second day up to Lost Lake two miles shorter and you could climb one of the near by mountains if you need more of a challenge. If you choose to do this, there is a small water source about half way up to the trail head. If you don't get water there, I don't know of another close by water source unless you hike into the valley past the trail head. Check out the my photo journal that contains many more details of the trip. This was a beautiful short trip that I would highly recommend. Steamboat Springs, Colorado is one of my favorite areas, anywhere. And when I think of Steamboat, I think of the Yampa and Elk River, the Elk River Valley, Routt National Forest, and the Mt. Zirkel Wilderness area. Not to mention the terrific skiing, the iconic retailer FM Light, the pro rodeo series, or the Steamboat Art Company. The Steamboat area is one of those special places that really does have something for everyone. And for me of course, the most important part is outdoor opportunities, especially fishing and hiking and backpacking. If you go to the Steamboat area, you must drive up the Elk River Valley. Go through town on Hwy 40 and about 1 1/2 miles outside of town go north (right) on Hwy 129 toward Clark and Hahns Peak Village. This is the most beautiful broad river valley that I am aware of in Colorado. The Elk River Valley is a private affair, so plan on enjoying it from the comfort of your car or bike or enjoy it like my wife and I did....running in the Steamboat Marathon. However you plan to do it, it will be worth your drive. From the court house in downtown Steamboat Springs, it is 26.2 miles to Hans Peak Village. If you've come to fish, then you have a lot of territory to cover. In my case, I'm generally in the area to watch baseball in August and although there is a ton of public water on the Yampa right in town, I recommend going somewhere else. The Yampa in town gets a lot of raft traffic and that can be pretty frustrating. It also gets hit hard by fly fisherman. For a better experience, either head up to Rabbit Ears Pass and pick a small stream to catch small brookies all day or fish the Elk River or one of the streams that run into it. A couple of years ago I went somewhere way up in the headwaters and I caught an entire bucket full of brookies. I didn't actually keep any, but I really did catch a ton of fish. Which, even though they were small, was a lot of fun. The North Fork of the Elk is a great option if you don't mind walking in a mile or so. I caught a bunch of fish, mostly on a stimulator (female yellow sally pattern). The biggest two fish were 12" and almost 14". The Elk River has some public areas and is beautiful water. I have only fished it once and what I remember is that it is fast and difficult to wade. Check out the photo album of my trip up the North Fork of the Elk River. See the photo album of this trip here. My wife and I managed to corral our two boys for the weekend and we headed for Nederland and on to the Indian Peaks Wilderness area. We hit the Hesse Trail head at about 11:00 a.m on Saturday and began our long, very uphill journey to Betty and Bob Lakes. Here are the vital details. Heads Up:You need a permit to camp in the Indian Peaks Wilderness Area. You can get a permit at the Boulder Ranger Station or the Ace Hardware in Nederland. Ace Hardware is on the west side of the road behind the bank, as you enter Nederland. Location:This is an easy trail head to get to and only an hour from Denver. Take Hwy 6 to the west side of Golden and go north on Hwy 93. Eight miles or so up the road, take Hwy 72 west to Nederland. You are also heading toward the Eldora Ski Area, so look for those signs. Just before you enter Nederland there is an unmarked road to the west. There is a sign for Eldora that shows the way and this turn is directly across from a Mexican restaurant. To avoid the only mistake you can make on this road, stay right and do not go up to Eldora ski area. Instead, you will head toward and through the little mountain town of Eldora. Continue on to where the paved road turns to a well maintained gravel road. This will take you to the well marked and possibly crowded area for parking (mostly along the road) near the Hesse Trail head. See trip details for more information on this. 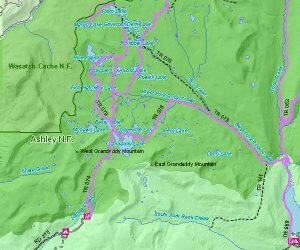 This is a map showing the Nederland area and the greater Indian Peaks Wilderness Area. I have highlighted the turn coming from the south just before town. This detailed Topo map shows the King Lake Trail to the Betty and Bob Lake Lake spur. Also, at Betty Lake I have marked two good areas for camping. I would recommend the area furthest up the trail. I was unable to include the very beginning of the trail, but it is the Hesse Trail head. You will find many other hikers here as it is a popular dog walking / day hiking area. However, once you get 1 1/2 miles in and branch off on the King Lake Trail, you will see few other hikers. Betty Lake holds some beautiful Cutthroat trout (check local regulations regarding cutthroat). We caught them on parachute adams, a mosquito, a prince nymph, some sort of sparkle tail caddis pattern, and a dark emerger pattern. The biggest fish we caught was less than 12 inches and we may have seen a 14 inch fish. Regardless of the size, these were beautiful trout....and they tasted good, too! We did not fish Bob Lake, but we did get a report that it was not yielding any fish. I have heard that it normally fishes pretty well with fish about the same size as Betty Lake. Skyscraper Lake, which would be another trip, is supposed to have larger cutthroat. Trail Report:Get ready for some up! Hesse Trail head is marked at 9000 feet and Betty Lake is right about 11,400 feet. Add a 40 pound pack to the mix, and this 6 mile hike is a bugger. The trail is very well maintained and much of it is nicely forested. Water is available regularly if you carry a purifier. The payoff on this trip is an incredible basin including three named lakes and three other unnamed bodies of water. This area is well worth the work it takes to get into. And as a great side trip, go back to the King Lake Trail and up to the top of the ridge. The view from this ridge down into the Frasier Valley, is spectacular. 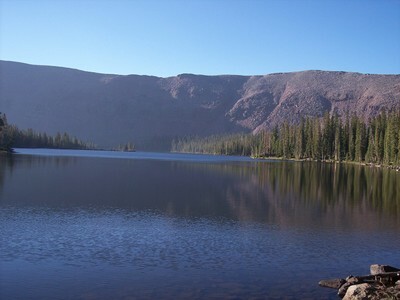 For the even more adventurous, follow the Corona Trail north along the Continental Divide to Devils Thumb Lake. Enjoy! Trip Details: You will need a 4wd to actually drive to the Hesse Trail head. However, there is plenty of parking along the road and there is a well maintained hiking trail just to the north of the 4wd trail. Don't forget these lakes are at 11,400 feet. That mean cool nights and late ice out. I visited this area on July 26-27, 2008. Just a couple of weeks ealier there may have been two much ice to fish these lakes. Skyscrapper Lake is reachable by bushwacking. The best route is probably west toward Bob Lake along the north side of Betty Lake and then just before Bob, drop over the ridge to the north. The Ace Hardware store in Nederland opens at 8 a.m. and does a really nice job with camping permits. They also sell area specific maps and other essentials. My friend Marshall and I headed for Wheeler Lake about 7:30 p.m. Friday night July 11th and returned Saturday afternoon July 12th. Our total trip was 11.2 miles. There were a couple of unique things about this hike, but before I get into that let me give you a few vital details. Location:This is an easy hike to get to and only 75 minutes from Denver. Take Exit 195 and cross to the south side of I70. Take a left at the light and your parking area is immediately on your right. You will need to hike back over the I70 overpass. When you get to the other side, the Gore Range Trail goes down almost immediately on your left. Click on map to enlarge. As of July, you could not start at the area marked TH (trail head). Follow my instructions above. Fishing Report: If you like salamanders, the lower or first Wheeler Lake is going to be like heaven to you. I never saw a fish. I admit, that does not mean there are no fish. But, the four to six inch salamanders that look a lot like fish were everywhere in the water. Frankly, it was kind of creepy. As for the other Wheeler Lake, I did not catch any fish. As for Lost Lake, now this is a classic mountain bowl lake. It looks deep and it looks like it hold fish. I left my fishing pole back at camp so I really don't know how the fishing is. Trail Report:Well maintained and a bit steep. The first mile is nearly flat and is right near I70. But from 1.25 miles to 2.25 miles you are treated to a nice climb. Not a killer, but it will remind you your alive. This is a well maintained trail that receives moderate use. My GPS said it was 3.1 miles to the end of the Wheeler Lakes spur. If possible, go back to the Gore Range Trail and continue on to Lost Lake. The trail to Lost Lake, especially after the first half mile or so, is well worth while. Water availability:Water is available throughout this trip if you carry a purifier. The Wheeler Lakes Trail is unique because you will be within site of Copper Mountain or I70 much of the trip. But, it is still a very nice Colorado mountain experience. If you take the Wheeler Lake Trail spur off the Gore Range Trail, be sure to go all the way to the end. The trail terminates in sort of an overlook spot that looks down on a beautiful bowl that is the top of Officers Gulch. Looking down the gulch you can actually see Silverthorne (I think) or Dillon. If it is night, the lights are neat to see and it's a reminder of how you can feel like your in the wilderness only a few miles from the lights of town. Be sure to go on to Lost Lake. The trail to Lost Lake is pretty easy and well worth the trip. As I recall, our total trip length to Lost Lake including our travel on the Wheeler Lake spur and back was 5.8 miles. We did not have time to go on to Uneva Pass, but it is less than a mile up the trail and looked to be a spectacular overlook of the area. I highly recommend this trip. It makes a great day trip or a late afternoon hike and camp trip. This weekend we checked out Wheeler and Lost Lake in the Gore Range. It was a beautiful trip. Check out the photo album in the upper right side bar or click here. I will write more about this trip in the next few days. 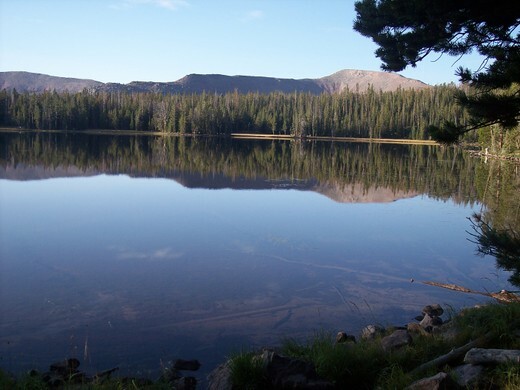 Why make the trip to Boulder Lake? Beware though, if your hoping for an "all by yourself wilderness experience", this is not your trip. This is a heavily used route. I would guess that we saw two dozen people and at least a dozen dogs on our trip. This trip starts at the Rock Creek Trailhead and despite claims that it is .34 miles to the Gore Range Trail, it is closer to 1/2 mile. I think they must be measuring the distance from where the wilderness area starts. The good news is that the Gore range trail is very well marked; as is the Boulder Creek Trail. We left the parking area near the trailhead just after 8:30 p.m. on Friday night. We were determined to make a camping trip out of this little hike and spend as much time with our daughter as possible. It turned out to be a good decision because we were able to get in 1.25 miles and find a nice area to camp. Click on the map below to see larger map and trip notes. These two links below are text files provided by USDA Forest Service. The USDA site is a GREAT site for hikers and backpackers! Overall, this was a really great trip with my girls. We wanted to keep it short because Corina is recovering from stress fractures in her foot and Chelsea is still recovering from her knee surgery. If you haven't checked it out yet, here is the link to our Boulder Lake photo album. Absolutely spectacular! Blow you mind unique. This is the High Uintas in Utah and my wife and I were lucky enough to spend a few days backpacking there recently. My fishing report, or anything I tell you about actually catching fish will be purely hearsay. I fished more than normal on this trip and did not do well. However, talking to several people we saw on the trail, it was obvious that these lakes yield a lot of fish. From a technique standpoint, I think one of the real keys is to get into or up near the deep water. The best way to do this is to wade on in. These lakes tend to be very shallow around the edges and trees ring the lakes closely. This make them very difficult to fly fish from the shore. Oh, and incidently, notice that the babe in the above picture is packing a fly rod. What a turn on! 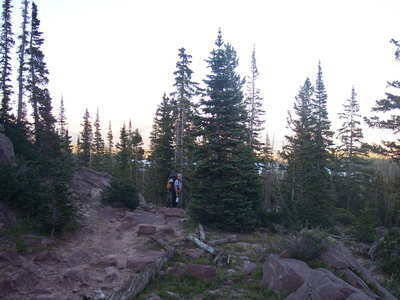 We headed into the High Uintas Wilderness on Grandaddy Basin Trail 074. This was a fortunate guess for us in what felt like a game of pin the tail on the trail head. For whatever reason we had a tough time getting good advice regarding where to start. We were lucky enough to find a small sporting goods shop in Logan Utah that had a couple of BLM maps of this area and we picked one that had lakes that we could reach quickly. If you click on the map, it will expand to a size that makes it readable. 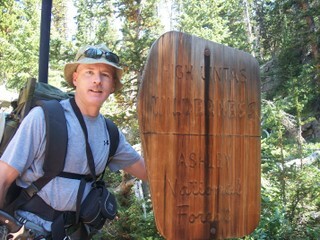 After a short time on the trail, we entered the High Uintas Wilderness. The first 2.5 miles was a steady up hill trail to Hades Pass. The trailhead where we parked was at about 9700 feet and the summit of Hades Pass was 10,640. Just after the summit, we were rewarded with this first view of Grandaddy Lake. We had left our car after 6 p.m. and I was feeling sick to my stomach and Corina had a sore throat. We were quite a crew keeping up a near sprint pace so we could find a camping spot before dark. We made it and found a spot next to Grandaddy Lake that was just perfect. In the morning, we woke up to this terrific view. Take a good look. I was struck by how if you took out the mountain background, this could be a scene from NW Ontario. We were on our way into an area of mountain lakes like I have never seen before. Again, if you go back and click on the trail map above, you can get an idea of how many lakes there are. And that map is only one small piece of the High Uintas. And this next one is our view from camp two. Again, spectacular. This was just one of the 5 lakes we visited on our short 15 mile round trip. The general area is more or less like a flat top mountain. After climbing 900 feet up and over Hades Pass, the area we hiked was only + or - 300 feet in total. Very easy hiking that would allow for covering some major miles if you had the time. I would love to take a 5 day trip into the heart of this territory sometime. As it was, Corina and I entered on Monday night at 6 p.m and we were back out at the trail head Wednesday at noon. 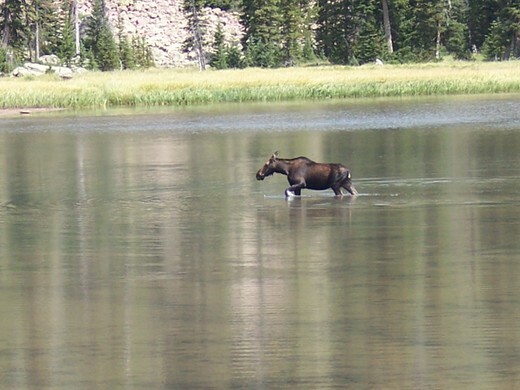 Before leaving, the cow moose below lazily worked its way out into the middle of this small pond. Very cool and worth the trip in itself! As you can tell from this write up, I would highly recommend this trip. One warning is that the Grandaddy Basin was obviously a heavily used area. So for us, Monday - Wednesday was a perfect time to be there. I would recommend an early morning departure if heading into this basin on the weekend and a good strong first day hike to get you away from the crowd. 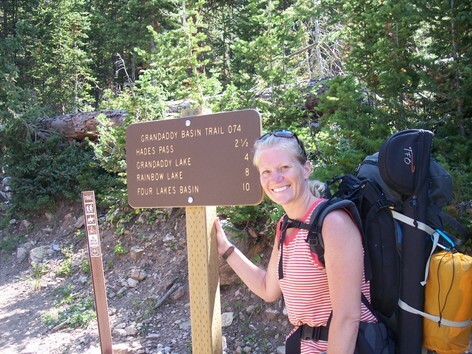 There are of course many other trail heads to enter at and I would be happy to help you find a map of the larger High Uintas area if you contact me.